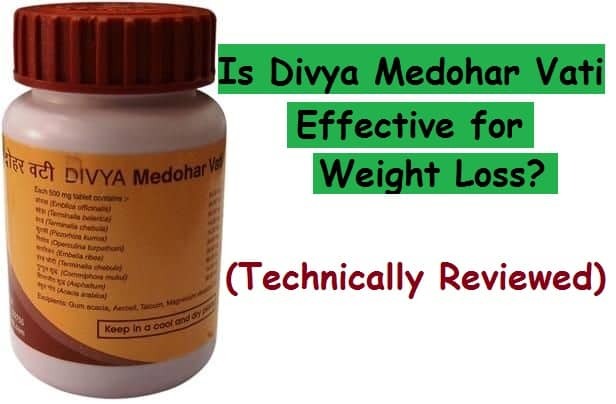 Is Divya Medohar Vati effective for weight loss? 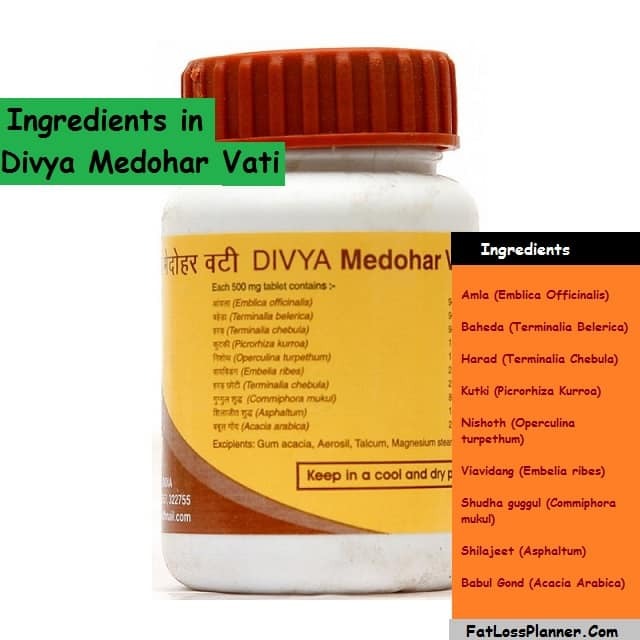 Divya Medohar Vati is a proprietary Ayurvedic medicine for weight loss sold by Divya Pharmacy. Medohar Vati is an extremely effective proprietary medicine to treat Obesity without any side effects. The reason Medohar Vati works so well is because of the ingredients used in it. Due to Poor eating habits and various underlying causes unwanted fat tends to get accumulated over a period of time. Therefore this wonder drug helps to lose weight by strengthening the digestive system and balancing your Vata, Pitta and Kapha. The ingredients used in this ayurvedic medicine is specifically targeted for weight loss and is extremely safe to be consumed. Hundreds of individuals use it daily but there are no genuine feedback or reviews online. So instead of relying on fake reviews and paid reviews I have decided to review this product based on its technicalities. In this article I will try to answer the question on effectiveness based on the ayurvedic herbs used in this medicine. Before we deep dive into the technicalities let’s take a quick look at the positive by products of this weight loss medicine. It helps to boost basal metabolic rate. Divya Medohar Vati also helps in balancing the hormones and stimulates normal digestive processes. It’s an excellent herbal remedy for managing blood cholesterol and high blood pressure. All the herbal remedies for weight loss in this product are natural and do not produce any severe side effects. It is a wonderful herbal remedy for people who gain weight quickly. Suppresses Hunger – May be a side effect in longer run therefore not suited for long term remedy. Stop it once you reach the target weight. Avoid if pregnant or if trying to conceive since it’s known to terminate the whole process. The natural ingredients of Divya Medohar vati helps in reducing weight naturally by increasing the metabolic rate and by balancing the hormones. The approach that Divya Medohar vati actually is purely holistic. What I mean is if you look at the ingredients carefully, you will find that it focuses on all the three aspects of Ayurveda i.e. Vatta, Pitta and Kapha. The better your Vatta, Pitta and Kapha are the less would the chances of poor body function. Poor metabolism and inflammation of fat cells only comes into picture when these 3 elements are disturbed. Therefore you will see that apart from weight loss, other underlying causes such as poor digestion, high sugar levels and blood pressure levels going down slowly and steadily. Amla (Emblica Officinalis): Amla is a potent source of Vitamin C and plays a crucial role in boosting immunity. It is mainly used for improving the digestion, hair quality, boosting immune system, improving skin quality and boosting the liver health. It helps in reducing weight by proper digestion of the food and maintaining high energy levels in the body. It is a unique herbal remedy for improving digestive functions. One spoon Amla fulfills the daily Vitamin C dosage (One spoon gives more than 6 times the daily vitamin C required). Loaded with Anti-oxidants, thereby providing anti-aging benefits. Baheda (Terminalia Belerica): When it comes to boosting metabolism there is nothing better than Baheda. It helps reducing body fat by converting it into useful energy. Baheda becomes a key ingredient in making triphala powder (Baheda, Amla and Harad) another excellent combination to fight obesity. Baheda not only cures obesity but also helps to fight common cough, cold and asthma. Inclusion of Baheda in this weight loss pill benefits the respiratory system in one way or the other. Harad (Terminalia Chebula): The purpose of including this natural herb is to correct any digestive disorders that may exist. It prevents the deposition of fat in the body by stimulating of the digestive organs. Harad is also known as Haritaki in Ayurvedic scriptures. Harad and milk when consumed before bed at night cleanses the stomach. Harad churna in a glass of plain water helps to detoxify the liver. Kutki (Picrorhiza Kurroa): It is bitter and very light by nature. It has purgative action and acts on the liver directly. Kutki in Divya Medohar Vati plays extremely important role by reducing excess pita and body kappa. It stimulates liver thereby promoting optimum fat Assimilation. Nishoth (Operculina turpethum): The main role of Nishoth in Medohar vati is to provide strength to the body and assist in reducing body weight by improving the functioning of the digestive organs. It reduces weight and excess fat from the body naturally as it’s an excellent laxative. Nishoth is not only helpful in reducing weight but also helps to fight impotency. In Ayurveda Nishoth is used to treat multiple ailments, curing obesity is just one of the other quality. Viavidang (Embelia ribes): The bitterness in Divya Medohar vati actually comes from Nishoth and Viavidang. The purpose of including Viavidang in Divya Medohar vati is to promote healthy digestion. The better your digestive system are, the better would be fat assimilating capacity. Just like its other counter parts Viavidang acts on the liver and produce excellent results in reducing body weight naturally. It is a safe herb and does not produce any side effects. Shudha guggul (Commiphora mukul): Guggul scraps away excess fat from the body and gives you thin and slim figure in a short period of time. It also helps by balancing the hormones. Shilajeet (Asphaltum): Just like its other counterparts Shilajeet helps in reducing weight by correcting Vata and Kapha in the body. It acts on the areas where fat gets deposited easily. The idea behind including shilajeet in Medohar Vati is to improve digestive organs and promote energy levels. Babul Gond (Acacia Arabica): This Ayurvedic her has a sweet taste and helps balancing Vatta, pitta and Kapha. It improves metabolism and helps in quickly reducing body weight. It may be taken regularly to get a slim bogy figure. With all the above ingredients what you may have noticed is that weight loss is not the only thing that comes along with these herbs. There are a lot more positive by products as well. If you combine them all you will find you are actually treating vatta, pitta and Kapha and not weight directly. This makes Divya Medohar Vati a holistic medicine to treat obesity. Along with consumption of Medohar Vati there are dietary changes that one needs to make. These dietary changes are extremely important to make this therapy effective. Poor dietary lifestyle along with consumption of Divya Medohar vati or any weight loss medicine won’t help. How are these Pills made in Patanjali factory? Below video will show you exactly how Medohar vati or any Pills are manufactured at Patanjali factory. Eat healthy and a balanced diet to maintain healthy weight. One should eat more fiber rich food such as fresh fruits and vegetables to reduce body weight. Try to limit the carb intake as much as possible. Avoid eating heavy food at night. Take a light meal at night as our body does not need much energy at night to do work. Eat small meals at small intervals of time. Avoid eating sweets and sugar at any time. Sugar increases the body weight much quickly. Drink more water to remove toxins and harmful substances from the body and proper metabolism of the food. Do not eat too much at one time. Keep your one fourth stomach empty for proper digestion of the food. Include tons of fruit juices in your diet (at least twice a day). As much as possible try to follow high protein low carb diet regime. Sedentary life is one of the main reasons of weight gain therefore try to avoid that. If you lack physical activity start doing exercise and increase your physical activity to maintain proper body weight. You can take part in small activities such as swimming, cycling, walking and doing small house hold chores to reduce body weight. It helps in utilizing extra energy stored in the body. Sleep is an important factor that may also contribute for increased weight gain. Reduced sleep increases the level of a hormone called ghrelin that increases appetite. Reduced sleep makes you feel tired that causes less physical activity and increased weight gain. Therefore, take proper sleep at night and avoid late night foods. You can reduce body weight by doing exercise, maintaining proper diet and taking Divya Medohar vati. This is the best and natural approach the you can take. Try and make many lifestyle changes for controlling weight and maintaining ideal body weight. People who lead a sedentary life generally are overweight. It is very important to do exercise to maintain ideal body weight. Exercise helps in burning of body fat and effective digestion of the food. Avoid late dinner as you may also suffer from heavy weight. It is important that one should eat dinner two hours before sleeping at night. Minimum two hours are needed for proper digestion of the food. Avoid eating much fatty and junk food can also cause heavy weight. Therefore, if you eat too much junk food try minimize the intake of junk food to control weight. Yoga exercise can also help in maintaining ideal weight. There are many simple yoga asana that help in controlling weight. It is very important to get proper sleep. You should avoid sitting for long hours in front of the computer or TV to maintain ideal body weight. Eating well balanced diet is very important. It is very important to eat proper nutritious diet to get proper nutrients. Fruits and vegetables are very important for getting a balanced diet. Fruits and vegetables help to provide essential vitamins and minerals to the body. Fatty food should be reduced and avoided from the diet as too much may lead to increase weight. Alcohol should be avoided as drinking of too much alcohol may be one of the main cause of increased weight. Too much coffee and tea should be avoided because these are rich in nicotine and caffeine that may increase body weight. If possible stop the intake of carcinogenic processed oils. Try cooking food without oil (The ayurvedic way – Known as satvik bhojan). Divya Medohar Vati should be taken half an hour before eating food or it may be taken one hour after eating food. It has to be taken with hot water. One to two tablets may be taken twice or thrice in a day, depending upon the body weight. Some obese people like us may require higher dosage of the Medohar Vati. Three tablets thrice daily is most effective dosage. One tablet after meal twice a day. Never consume more than the recommended dosage as it’s also known to have side effects when over dosed. Looking at the price point, Benefits and Side effects I think it gives a positive feeling. This feeling comes mainly when I compare side effects VS the Benefits. The benefits derived from this ayurvedic weight loss medicine far outweighs the side effects. Having said that I won’t recommend this for more than a month. It’s advisable to follow on and off method i.e. use it for a month and give a gap for 3 months and then use it again. Continue this for a year and once your target weight is achieved drop this medicine. After giving up this medicine follow a healthy lifestyle to maintain healthy weight. And maintaining weight might be difficult if you are not extra careful about your diet. So, Is Divya Medohar Vati Effective for weight loss? I would say look at the pros and cons and then decide for yourself. The reason I am saying this is because if you are a thyroid patient or pregnant women then this may not be good for you. On the other side if your obesity is due to poor metabolism, blood pressure or diabetes then this may suit you more. For an average people without any underlying diseases Divya Medohar Vati may just be a good choice. Thank you so much for all this wonderful information. Thanks a lot for important information. Hi, Can I take this medicine? I am suffering from hyperprolactinemia making periods irregular, due to which weight gain is unstoppable. It increases a bit every day. Please, I am looking for a genuine suggestion to help me lose weight and also regular my periods. 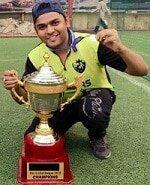 To begin with I would say best is to consult Nadi Vaidya i.e. an ayurvedic doctor. Having said that along with Medohar vati you need to switch to a 50-50 diet. Meaning 50 percent of your food should be in raw form and 50 percent in cooked form. can we take this tablets without doctor permission…? If we start to take this tablets this is continuous or we can take one bottle and stop it, if we doing so there is any side effect ? please respond to this message . If you are absolutely sure that obesity is not due to any other underlying cause you can use it. Having said that best is to approach an ayurvedic doctor so that he can do a thorough diagnosis.